NoMix technology for fast-industrialising countries? The introduction of flush toilets in fast-industrialising countries often has a devastating impact on the environment, owing to the lack of appropriate wastewater treatment measures. 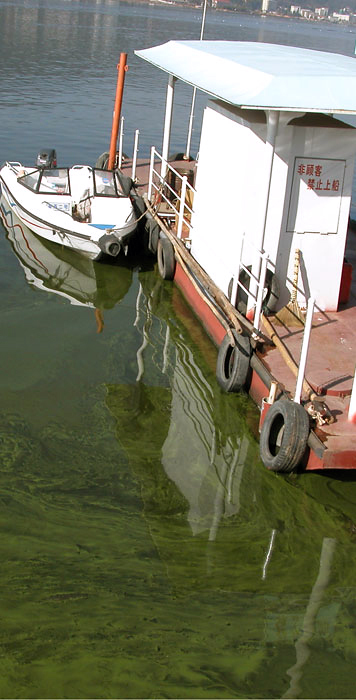 In the Chinese city of Kunming, situated in the basin of the heavily polluted Lake Dianchi, the potential for treatment at sewage plants is virtually exhausted. If water quality is to be improved, measures such as urine source separation will be required. Stakeholders’ attitudes towards the NoMix technology are highly positive – which could pave the way for the large-scale implementation of this system. Nova 8 was concerned with the introduction of the NoMix technology in fast-industrialising countries, where conventional end-of-pipe approaches to wastewater treatment are generally preferred at present. Source control measures such as urine separation could offer a good alternative – not least because of the acute demographic pressures faced by these countries and their often limited financial and scarce freshwater resources. In cases where no sewerage system is yet in place, fast-industrialising countries have greater scope for planning than typical European nations. Kunming, the capital of Yunnan Province in South-West China and sister city of Zurich, was selected as the pilot region for Nova 8. With a population of about 2.4 million, the city lies on Lake Dianchi, a shallow waterbody with excessive phosphorus levels. By 2020, the number of inhabitants is expected to have grown to 4.5 million. Although six modern wastewater treatment plants have been built in recent decades, water quality in Lake Dianchi has not improved. The projects were financed by the Swiss National Science Foundation (SNF; www.snf.ch) and the Swiss Agency for Development and Cooperation (SDC; www.deza.admin.ch) and carried out under the Swiss National Centre of Competence in Research North-South programme (NCCR North-South; www.nccr-north-south.unibe.ch). The work received strong support from stakeholders in Kunming – an indispensable aid in gaining access to data and other information. In a doctoral thesis, a methodology was developed for material flow analysis of wastewater – including constituents and pollutants – in fast-industrialising countries, tailored to the particular requirements of such regions. The key factors to be considered are the scarcity of data and rapid urban development. In the study, various strategies for wastewater treatment were evaluated on the basis of material flow analysis, including a number of source control measures . As a case study, the wastewater system in Kunming was modelled. The most important finding was that only about 25% of all urban wastewater is treated at the city’s six wastewater treatment plants; the remainder is discharged into the lake untreated. One of the main reasons is that clean water – especially ground and river water – infiltrates the sewers, so that wastewater is diluted in a ratio of at least 1:1. As a result, around 1600 of a total of 1960 tonnes of phosphorus in urban wastewater enters the lake each year. The ambitious goal set by the local authorities, however, is to restore water quality to 1960 levels, which would mean that only some 30 tonnes of phosphorus per year could be discharged into the lake. This assumes, moreover, that similar efforts are undertaken by agriculture and industry . Lake Dianchi is essentially too small and too shallow to absorb the wastewater from such a huge city – quite apart from the fact that it is also exposed to phosphorus inflows from other sources. The model indicated that even with "perfect" technology – conditions approximated by the infrastructure in Zurich, for example – the targets set for water quality would not be attainable: at least 56 tonnes of phosphorus per year would still be discharged into the lake. The potential contribution of urine source separation was also revealed by the model: if two thirds of all urine was separated and this source control measure was combined with "ideal" wastewater treatment technology, the goal would only be narrowly missed, with phosphorus inflows of 39 tonnes per year . The real challenge now lies in finding a combination of rational measures that is both realistic and will make it possible to achieve the ambitious goals. Clearly, different solutions will be required for urban as opposed to rural regions, and for older parts of downtown Kunming as opposed to new developments where an infrastructure has yet to be established. What solutions to the problems discussed above are preferred by local experts? The situation was first analysed on the ground in order to gain an understanding of decision-making processes and to identify the local actors . Two-hour interviews were then conducted with representatives of 32 different stakeholder groups, so as to determine their attitudes to source control measures in general and to urine source separation in particular . The most important actor – together with the highest-level political bodies and various environmental protection and planning agencies – is the Dianchi Lake Protection Bureau . This authority plays a key role in all decisions concerning the lake. Local experts also mentioned the important role of private real estate companies, which have the ability to promote or reject alternative wastewater management technologies. An important part in decision-making is also played by research institutes, which can carry out pilot projects. As Nova 8-2 showed, successful pilot projects may trigger large-scale initiatives (see below). Almost all of the local experts have a favourable attitude towards source control measures . Unlike European specialists, however, they tend to approve of such measures for concentrated wastewater streams, such as toilet waste, rather than for "clean" wastewater, such as rain and river water. The respondents were well aware of the problems associated with existing technologies, such as dry toilets. Nonetheless, an optimistic view is taken of technological developments, and such measures are increasingly accepted by society. Nova 8-2 included a pilot project involving urine-diverting dry toilets in a rural setting [4, 5]. Overall, this project was very successful, prompting plans to install more than 100’000 dry toilets in similar areas. In fast-growing cities of fast-industrialising countries with significant population pressures and scarce freshwater resources, the limits of end-of-pipe wastewater treatment solutions are increasingly apparent. In Kunming, urine source separation can make an important contribution to resolving the wastewater problem. Different approaches will presumably be required for rural and urban areas. It is clear that, faced with a population explosion, the city of Kunming is pressing ahead with efforts to rehabilitate the lake – an extremely challenging task. At the same time, stakeholders in this highly dynamic city show a marked willingness to accept innovations, and concrete measures can be quickly implemented in rapidly expanding regions of this kind. Huang, D.-B., H.-P. Bader, R. Scheidegger, R. Schertenleib, W. Gujer (in press) Confronting limitations: new solutions required in urban water management in Kunming City. Journal of Environmental Management (available online). Medilanski, E., L. Chuan, H.-J. Mosler, R. Schertenleib, T.A. Larsen (in press) Identifying the institutional decision process to introduce decentralized sanitation in the city of Kunming (China). Accepted for publication in Environmental Management. Medilanski, E., L. Chuan, H.-J. Mosler, R. Schertenleib, T.A. Larsen (2006) Wastewater management in Kunming, China: a stakeholder perspective on measures at the source. Environment and Urbanization 18(2): 353–368. 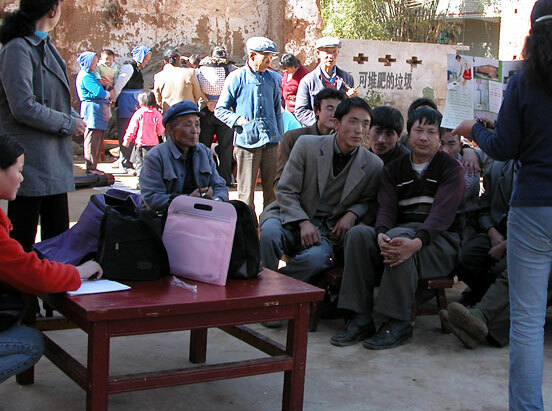 Kunming Insitute of Environmental Science (2005) Implementation, monitoring and promotion of urine-separating dry toilets in Zhonghe Village, Kunming, China. Final Report of the PAMS SEA-3, download report. 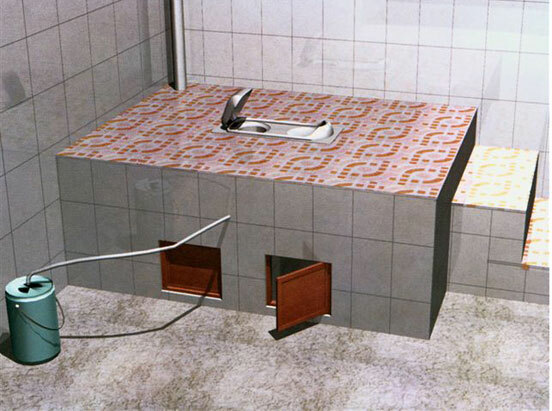 Chuan, L., L. Ronghuai, F. Jinming, A. Morel, E. Medilanski (2005) Social acceptance of urine-diverting dry toilets in Zhonghe Villlage, Kunming, China. Result of the survey conducted in the framework of the PAMS SEA-3 project of the NCCR North-South programme, download report.